Mission Statement: The Boyne City Airport provides an aviation gateway to world class living, dining, shopping and business attractions in northwest Michigan by ensuring the Boyne City Airport offers premier flight safety, friendly and convenient amenities to the aviation community with citizen responsible stewardship and management. 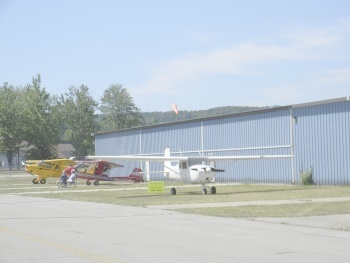 The Boyne City Municipal Airport is located one mile east of Boyne City off East Main Street and is adjacent to the Air Industrial Park. It is an unattended facility. N98 provides safe and convenient aviation friendly services for local and visiting air traffic. Placing safety first, N98 offers RNAV GPS approaches to paved 4,000 ft. of lighted and well maintained Runways 9 & 27. Upon landing, pilots will enjoy 24hr/7day a week, self-serve 100LL aviation fuel, a lighted and heated/cooled terminal with FREE WiFi connectivity and restrooms. Need a ride? An airport courtesy car is available free of charge. Entrance to the terminal requires a combination. This combination is in the Michigan Airport Directory. Dimensions 4001 x 75 ft.
Elevation 654.7 ft. 659.3 ft.
Michigan Aviation newsletter is now available online. Follow the link and then click on "e-Michigan Aviation"